The Flint Hills is an area of east-central Kansas with a unique character. It is a high, wide, gently rolling landscape blanketed with the largest continuous area of tallgrass prairie left in the world. This page of the Natural Kansas website highlights the best sites for wildlife watching in the Flint Hills. 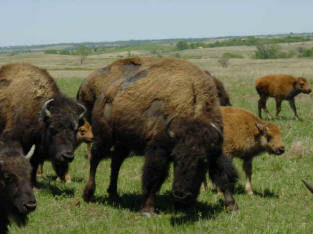 The animals inhabiting the tallgrass prairie are as unique as their habitat. 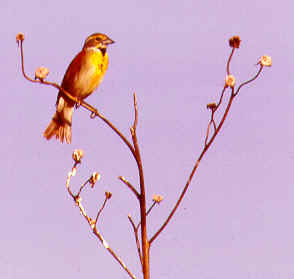 photo by Bob Gress During summer, watch for dickcissels singing from fence wires and tall weeds. They have a bright yellow breast with a small black bib. These sparrow-size birds winter in South America. 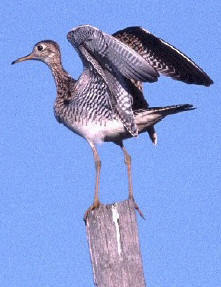 The upland sandpiper is a distinctive member of the Flint Hills fauna. Their ethereal bubbling call is often heard before the bird is seen. They are a migrant, present only during the warm months. photo by Jim Mason The bison that formerly inhabited this landscape no longer roam free, but you may visit them at Maxwell Refuge. There, in fact, you may take a tram ride out into the middle of the herd! 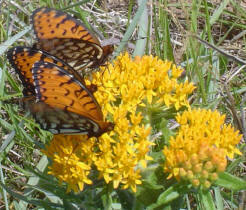 Regal Fritillary butterflies are only found in the tallgrass prairie, and may be observed in June-July nectaring at flowers and chasing each other in nuptial flights or territorial disputes. Dozens of other butterfly species are found here also. the beauty of the Flint Hills in this video. For more videos from this series, see the KDWP website. The prairie is more than grass. Over 800 different kinds of wildflowers bloom in Kansas! The flower show in the tallgrass prairie begins in March and proceeds in an ever-changing pageant of color and form through October. A ramble through the fields at any of the wildlife watching sites listed here will produce delights for the careful observer, but many beautiful blooms may be seen along the roadside too. There are two peak times for wildflower variety - mid-May through June and August through mid-September. As with any other plants, the weather pattern determines the sequence and vigor of blooms for any given species. Timely rains and an abundance of sunshine in this month and cool weather and drought in that month will make a big difference in what can be seen during those times. Every year is different! The wildflowers shown below are just a few of the beauties awaiting you in the Flint Hills. 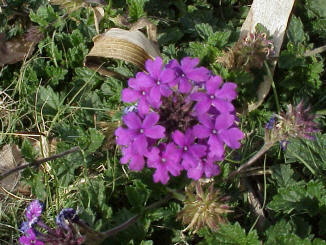 In spring, watch the rocky outcrops and cutbanks for ROSE VERBENA. It grows in low clumps and has a very pleasant fragrance. Its clusters of light purple flowers are a favorite nectar source for butterflies. 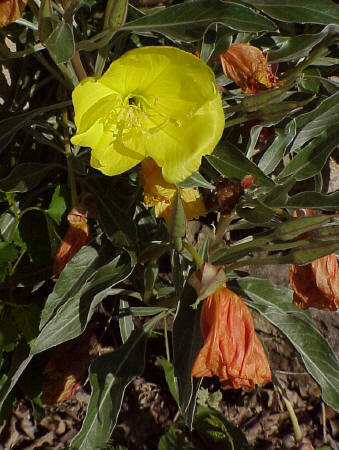 In May-June the extravagant blossoms of Missouri Evening Primrose light up the roadsides. Often growing out of cracks in exposed rock formations, its petals extend more than 3 inches in width. The flowers open overnight and fade the following day. The faded blooms are an attractive salmon orange. 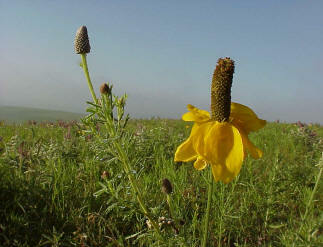 UPRIGHT CONEFLOWER is an early summer bloomer in the tallgrass prairie. A member of the sunflower family, it is the prairie cousin of Black-eyed Susans. 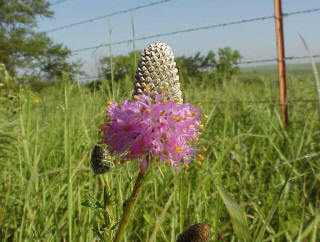 PURPLE PRAIRIE CLOVER decorates the fields with its unusual violet flower clusters in summer. Extending nearly 200 miles from near the Nebraska border on the north into Oklahoma on the south, the Flint Hills reach their greatest width just south of the Kansas River, about 80 miles. They owe their existence to the nodules of chert (flint) laid down with the limestones and shales in the shallow seas which covered this part of North America during the early Permian Period over 275 million years ago. Chert is a very hard mineral and was prized by the Native American tribes as an ideal material for making arrowheads, spear points and cutting tools. The presence of this hard, weather-resistant mineral in the underlying rock formations slowed the process of erosion, leaving this area higher than the surrounding countryside. It also prevented this ground from being broken out for agriculture, unlike the tallgrass prairies of Iowa and other locations further east. As a result, the Flint Hills region remains as the largest unplowed remnant of tallgrass prairie in the world. visit the GeoKansas website, listed in the Links below. The GeoKansas website is a great resource for learning about the geology of the Flint Hills and all the other regions of Kansas. Click here to see a list of reference books for your travels through the Flint Hills. The Flint Hills National Scenic Byway follows Kansas Highway 177 through the heart of the Flint Hills. The Flint Hills Wildlife Drive will give you an excellent look at the Flint Hills from well-maintained gravel county roads. The Flint Hills Tourism Coalition website lists and describes the range of attractions to be found in the Flint Hills - cultural and historic as well as natural - and has a comprehensive lodging list. The human and natural history of the Flint Hills has been the subject of several books. Find a list of them here.